As farms continue to consolidate it becomes increasingly important to assess a farm’s management skills. At a certain farm size, it is no longer easy or feasible for the manager or managers to wear every management hat. How does the management team determine when to focus on professional development, delegate management tasks among mangers, and seek outside assistance? This is the third article in a series of articles pertaining the assessment of management skills. 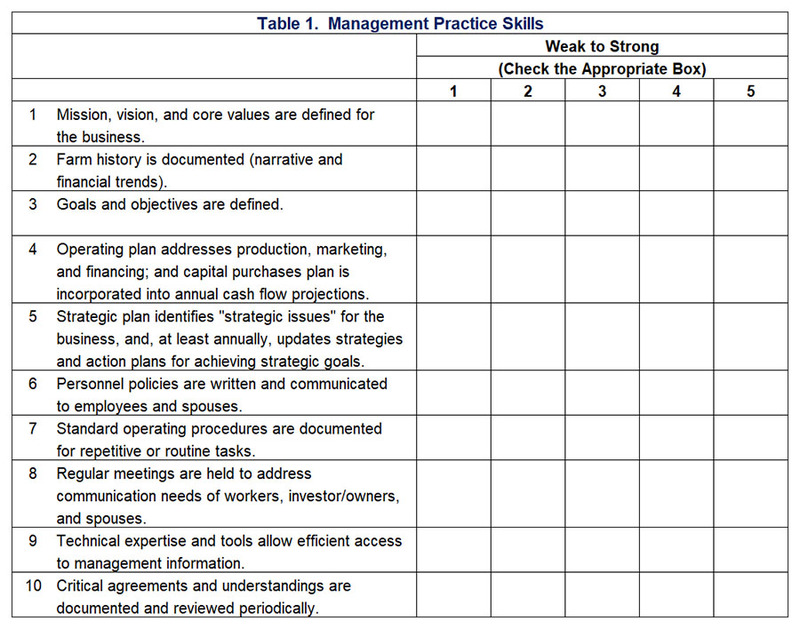 The topic of this article is the assessment of management practice skills. Table 1 presents important management practice skills. Skills listed include defining mission, vision, and core values; documenting farm history; defining goals and objectives; developing an operating plan that addresses production, marketing, and finance; identifying strategic issues; developing and communicating personnel policies; documenting standard operating procedures; addressing issues through regular meetings; enabling efficient access to management information; and documenting and reviewing critical agreements. Each farm operator should rank their ability with respect to each skill using a 1 to 5 scale with 1 be relatively weak and 5 being relatively strong with respect to that skill. The idea behind checklists such as that presented in table 1 is to assess whether a farm has a skills gap, which is defined as the difference between skills that a farm needs and the skills of their current workforce (operators and employees). Conducting a skills gap analysis helps a farm to identify skills that will be needed to become more efficient and expand. It can also be an important input into hiring programs, employee development plans, or hiring outside consultants. There are numerous reasons why a farm should develop and update their business plan (Parsons, 2015). First, business planning allows you to examine and clarify your goals and objectives. Second, business planning increases the likelihood of business success. Third, business planning increases the speed of accomplishment by allowing you take a close look at your business organization. Fourth, business planning provides a framework for decision making. Fifth, business planning provides a mechanism to inventory capital and personnel needs. Sixth, business planning forces you to objectively examine your strengths and weaknesses. Parsons (2018) discusses the six key components of a business plan. These components include an introduction, land resource inventory, equipment and building inventory, marketing plan, human resources, and financial history and projections. Examining your farm’s management practice skills is particularly important when developing the introduction and human resources sections of your business plan. The introduction typically contains mission, vision, core values, farm history, and goals and objectives. The human resources section describes the skills of those involved in ownership and management as well as those responsible for day-to-day tasks.